This is my take on a folding step stool design that's been around forever. My grandmothers each had one like it in their '50s kitchens. Today, fifty years later, you can point, click, and have a new one delivered to your door from any of a number of online vendors. Many of these vendors describe their stools as "Amish". I'm not sure if that means the design is somehow Amish, or if the stools are being made by Amish builders, or what. In any case, they're pretty handy, and a heckuva lot safer than that upside-down Home Depot bucket you've been climbing on to reach the top shelf where Grandma keeps her gin. Thanks to John Sprofera, you can also download a simple SketchUp model of the stool by clicking here. There's also a more detailed SketchUp model here. It shows the joinery in more detail, and has dimensioned drawings of all the individual parts. This file contains the same set of drawings, but in PDF format if that's more convenient for you than SketchUp. I made my stool from oak, and finished it with several coats of wipe-on polyurethane. I used through mortise and tenon joints between the legs and the transverse stretchers, and floating tenons to join the legs with the side stretchers. I attached the seat and the steps with screws running up from underneath. These screws are set into oversize holes to allow the seat and the steps to expand and contract across their widths with changes in humidity. This precaution probably wasn't necessary for the steps because they are so narrow, but probably was for the seat. Almost any wood would work for this project, although it might be a good idea to use a hardwood dowel for the step pivot, even if the rest was made from softwood. Likewise, any number of joinery options could work as well. While there's nothing magical about this particular design, it is very important to get the shape of the side pieces that hold up the steps correct, as well as the location of the pivot pin. If you don't, the step assembly might hit one of the stretchers when it shouldn't. Be sure to keep this in mind if you decide to modify the plans for some reason. 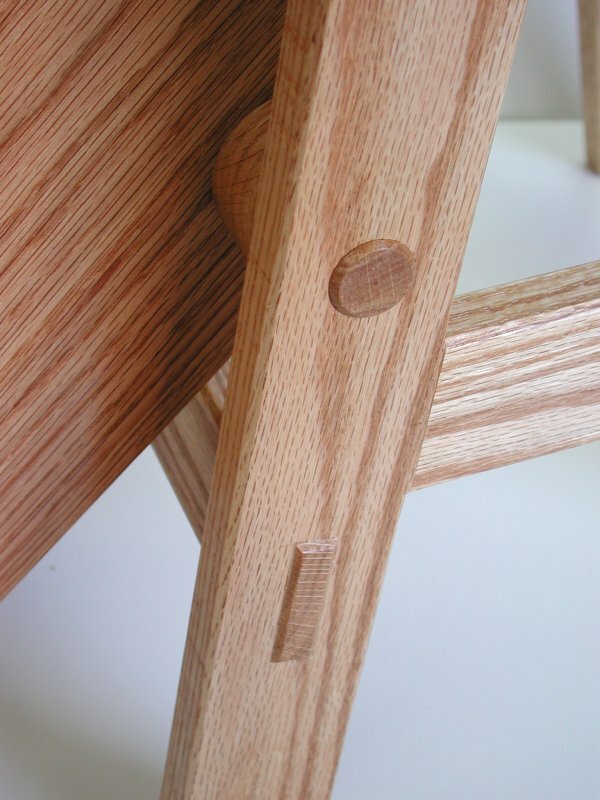 The other thing to watch out for is the grain direction in the side pieces that hold up the steps. It's best to orient the grain as shown in the first picture above. Unfortunately, this makes it a little bit tricky to lay out the shape of these parts. To solve this problem, I made a full-size template out of 1/4" MDF. Then I traced around the template and cut out the parts slightly oversize with a band saw. Then I attached the template to the rough blanks one at a time and trimmed them to their final shape using a router with a flush trim bit. Nice build and great pictures of the finished product. This seems like a truely useful and stylish piece. Thanks for sharing this and the dimensions too. Great job. I like to copy. 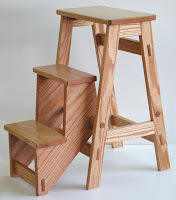 I search all over the internet for picture of a folding step stool to copy but when I ran across your site and saw your plans I couldn't resist the invitation to use your easy to follow plan to build my folding step stool. I noticed was there was no detail pointing out the size to make the dowel hole. I just assumed it was 1". Other than that I enjoyed having you plan to build my project. Thank you for the plan and nice work on your folding step stool! @Anonymous: I think I used a 7/8" dowel on my stool, but 1" should be just fine, too. I'm glad you liked my plans. It looks beautiful, great job. I'm heading out to get the oak now, the kids will love it in the bathroom. Thanks for the plans, I was dreading trying to lay this out from scratch. Can you tell me the angles you used on the folding step? If you click on the second drawing, it should give you all the dimensions you need to lay out the folding step. So I am not sure what angles you have questions about. Please let me know and I will try to help you. I wish I could post a picture of what I"m talking about. I started to create a 3D model of the steps but something is off. The top step risers are at an angle, just wondering if you knew that angle. I've calculated 4.92 deg on the front and 3.81 on the back of the top step. Okay. I think I understand. I have updated the drawing to show the three oddball angles on the step. You may have to refresh your browser's cache to force it to grab the updated version of the drawing. I made your stool today as a Christmas present for my mother in law. The stool turned out beautiful and saved me from designing something on my own. Thank you! You're welcome! Glad you like the stool and the plans. Thanks so much for sharing your plan. We saw on similar this weekend, and of course my wife wants one. Do you have a list of materials for this project? @Anonymous: The materials list is pretty simple. You need enough wood to make the parts shown in the plans, a handful of screws to hold the steps and the seat in place, and finishing materials (stain, polyurethane, whatever) of your choice. That's it! Thank you for sharing your plans! You wrote that the seat and steps are connected by screws running up from underneath. Are those wood screws that run through cleats (with oversized holes) into the seat and steps? @Anonymous: You got it! Try this link to see another guy's stool built from these plans. The last of his six pictures shows the cleats more clearly than mine do. Wow - I saw a stool like this some 30 years ago. I always wanted to build one. Sure do appreciate your photos and dimensional drawings - but I'm a bit intimidated by those angles on the stairs. Don't let the angles on the drawing of the stairs scare you. They're there mostly just for reference. If you lay out the location of the pivot pin and all the corners of the parts according to the dimensions given, the goofy angles will all take care of themselves. However, you do need to pay attention to the angle shown on the other drawing so you know what angle to cut the ends of the legs and stretchers at. But that angle is just an even 10 degrees in every case, so that shouldn't be too scary. Quite a few people have built stools from these plans, so it's definitely possible. Just go for it! So are the spacers on the dowel free floating spacers, or are they pinned in place? And does it matter? I left the spacers free floating. 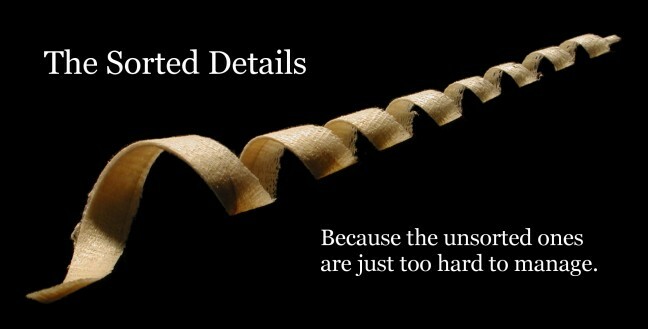 There's no reason to pin them, and drilling a hole in the dowel would only weaken it. I don't think it really matters, but you have to think about how you are going to assemble the stool. For example, if you glued the dowel into the folding sides first, you might have a heck of a time assembling the frame around it. On mine, the dowel is a press fit in the holes in the 2" legs, and a loose fit in the holes in the folding sides. So when you fold the steps up and down, the dowel does not rotate. With that arrangement, I was able to build the frame and the steps separately, then just thread the dowel through all four holes as the final assembly step. I got lucky with the "press fit" part, and didn't need anything besides friction to hold the dowel in place. My plan had I not been so lucky was to pin the big dowel in place with a smaller dowel in a hole in one of the legs. John, thank you for the SketchUp model of the stool. I have posted it online and added a link to the file in the body of the article. According to the CAD model, the minimum size for the boards on the sides of the steps is 8-5/8" wide by 17-1/2" long. Of course you'd probably want a little extra in both dimensions to start with. Click here to see exactly what I'm talking about. If I remember correctly, I didn't have stock that wide when I made my stool, and edge glued some narrower boards together to get the required width. Best of luck with your project. Just made one, following the dimensions for height (I used 8 quarter Hickory) and it worked out great. Only thing I'll change on the next one is the steps. I'll make them 1" longer to bring the center of balance out. If you step on the back side of the top step it can try to flip in. I made spacers for the dowel 1" and it worked perfectly. The other change is I used pocket screws, it was my wife's Christmas present I started on Christmas eve and had to be done in one day. I love mortise and tenon joints but didn't have time to hand chisel them. Thanks for the great sketches and dimensions.